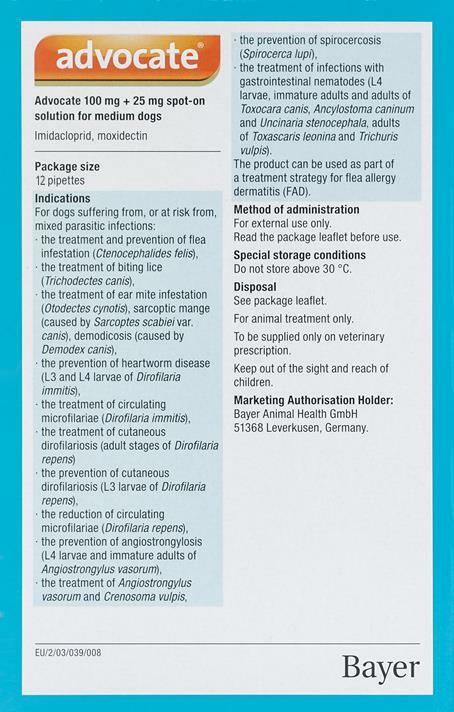 Does Advocate prevent/kill hookworms, roundworms, whipworms, treat Dirofilaria immitis circulating microilariae, control sarcoptic mange? Yes, Advocate covers all of the above. Does Advocate Multi prevent/kill hookworms? Yes Advocate / Advantage Multi kills/prevents hookworms. It contains 10% imidacloprid & 2.5% moxidectin. Not aware of any problem with dogs of herding breed but please consult your vet first. I read an article suggesting Advantage Multi might kill adult heartworms. True? Yes, it is delivered to Australia.